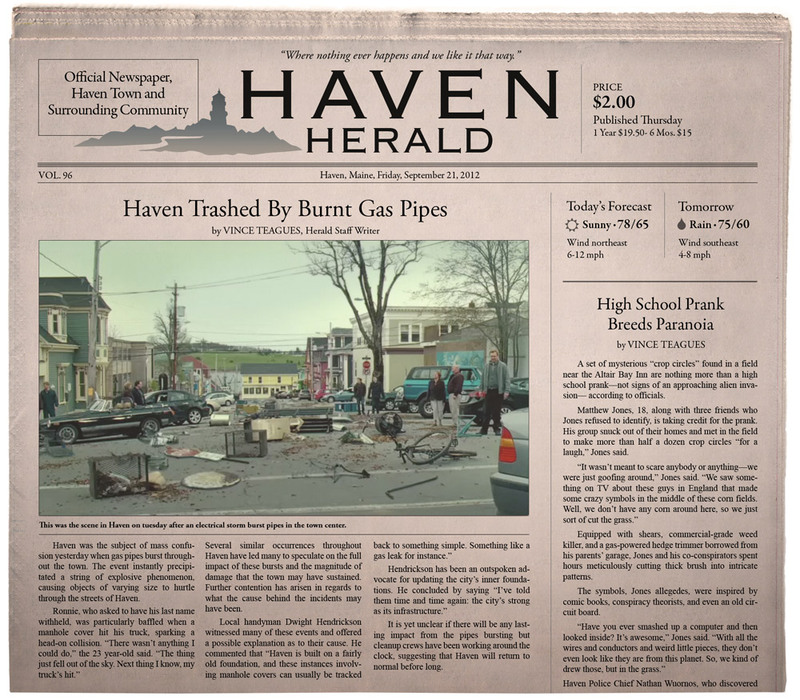 Read all about Haven happenings in the Herald. 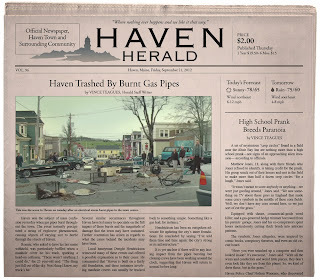 The hit Syfy series Haven returned Friday night, and picked up exactly where we left off last season. FBI Agent-turned-small town cop Audrey Parker is missing, and her partner (and now, sort-of boyfriend) Nathan, has loveable ne'er-do-well, Duke, at gunpoint aboard Duke's boat. "What did you do with her?" Nathan demands, as Duke (and the rest of us out here in TV Land) notices that Nathan now sports a mysterious tattoo that supposedly marks the person that will, eventually, kill Duke. Of course, by now, half the town has that same tattoo, so make of that what you will. The boys tussle for a bit, and a drop of Nathan's troubled, can't-feel-a-thing blood drips onto Duke's forehead, sparking his - let's call it superpower - new found incredible strength. At the same time, Duke's boat becomes magnetized, which Nathan assumes is related to Duke's strength. Duke swears it isn't, and explains to Nathan that he really, truly, has no idea where Audrey could be. Sure, there was evidence at Audrey's place to implicate him, but it must have been planted to turn the boys against each other. Nathan may or may not buy this theory, but the two go off to search for Audrey together. Meanwhile, Audrey is tied to a wooden support somewhere dark and scary, and a man is grilling her about the whereabouts of the Colorado Kid. You know, the same Colorado Kid who died 27 years ago. The man is completely obscured by shadow and flashlight glare, and it sounds like his voice is being altered. Audrey tells him to "go to Hell," and he slaps her across the face. That, folks, is all before the opening credits. This is going to be one heck of a season. Back in town, the sudden magnetic anomaly has wreaked havoc. WWE Superstar The Edge's Dwight (or, as my husband calls him, Thor) is busily explaining to the residents that this was nothing to worry about, and just a routine gas explosion. I don't know about anyone else, but the idea that my town had routine gas explosions would worry me more than any Trouble. Anyway, Thor/Dwight is handling Trouble cover-up while Nathan looks for Audrey, as well as another woman who has just gone missing. Once the magnetism is under control, Thor questions newspaperman, Vince, about the possibility of his brother, Dave's, involvement in Audrey's disappearance. For no apparent reason, Vince's nose begins to bleed. Across town, at the Altair Bay Inn, Nathan and Duke (who is filling in as partner?) meet the slightly "off" son of the latest abducted woman, Rosalyn. The son, Wesley, explains that she is the owner of the Inn, was already missing when he arrived, and couldn't be out for a walk, because she has a prosthetic leg. He then starts to sound like he's watched one too many episodes of CSI as he leads the guys to the "uncompromised" scene of the crime: A giant blood smear leading out the door and onto a bluff-side veranda. As he describes his theory for the abduction, CSI gives way to X-Files. Wesley believes this was a "standard" alien abduction. "They're coming," he says, and he wants to stop them. Duke convinces Wesley to go to the station, where they have better alien-stopping equipment (Nathan says they've upgraded), and as Wesley starts off toward the truck, the boys wonder if he's just nuts, or could he have killed his mother. Does he know where Audrey is? That's about the time they notice that Wesley has taken off on a moped, and is leaving them in the dust. Hey! Guess where Audrey is! Turns out, she's locked in the basement of the Inn ... with Rosalyn! The scary faceless man is still questioning Audrey about the Colorado Kid, and spouts out that he knows that Audrey is also Lucy from 27 years ago, and that he knows that she is in love with the Colorado Kid! Well, then. Doesn't that just open up a whole new bag of questions? Rosalyn is on the other side of a wall, so we never see her, but once the man leaves, her disembodied voice tells us that the Colorado Kid was once a guest at the Inn. Other than that, Rosalyn knows nothing about him. She's just scared for her life. Audrey assures her that she is a police officer, and is going to get them out. While this is going on, the boys lose Wesley when their truck stalls on the road. The truck is dead. The CB radio is dead. Even Duke's cell phone is dead. Nathan vainly checks the engine, determined to fix the problem. Duke argues that this is obviously either a Trouble or aliens, or something non-engine related. The more he argues, the more stubborn Nathan becomes. Finally, Duke calls him out on his feelings for Audrey, and Nathan explains that Audrey is the only person he can feel. Out of nowhere, an invisible force grabs Nathan by the ankles and drags him into the center of a crop circle. Duke follows and they realize this is just one crop circle out of many. Then, just to drive the point home that maybe Wesley is onto something, a UFO flies overhead and crashes near a farmhouse - Wesley's farmhouse. Back at the Inn, the crash starts a fire that Audrey handily (okay, foot-ily) puts out by kicking over a bag of potting soil. In doing so, she finds a shard of glass on the floor and uses it to begin cutting her ropes. This causes a great deal of pain, and Audrey tells Rosalyn about Nathan. He's better at dealing with pain than she is. Rosalyn wants to hear about Audrey's life, which is "complicated" and "inconvenient", and the two bond. Just then, Audrey hears the man go after Rosalyn and begin to beat her. Rosalyn screams for her life while Audrey screams that she will tell the man about the Colorado Kid! Back at the crash site, Nathan has handcuffed a raving Wesley to the truck. He has to disrupt the alien Nav Signal. Thor, Vince, and Dave come out to investigate (did they walk clear across town? I don't see another vehicle?). The men check out Wesley's house, and find the inside covered in newspaper and tabloid clippings of alien activity. The activity all mirrors the events of the day: the reporter's nosebleed, a small crash, unexplained magnetism, etc. The only events that have not yet happened are lights over the city (not too bad) and the leveling of a town (very, very bad). The men realize that this is definitely a Trouble, most likely brought on by his mother's abduction, and that Wesley is bringing all of this on with his imagination. It's not real, but as Dave points out, "What counts is what's real in his mind." Wesley doesn't believe the Troubles are real. His Grandpa told him stories of the aliens before being abducted himself. As he becomes more and more agitated, lights appear in the sky. At the Inn, Audrey is finally free of her ropes, and is searching for Rosalyn. She finds a phone and calls Nathan, telling him that she is at the Inn and that her kidnapper has Rosalyn, too. Nathan and Duke hurry to the Inn, where Duke finds Audrey, who then runs to hug Nathan. Duke appears obviously crushed, as Audrey tells Nathan that the mystery man must still be in the house. Wesley is introduced, and hangs firm to his belief that aliens abducted both women, since Audrey could not describe her kidnapper. Suddenly, Duke smells something odd. The group runs outside, where the remains of someone with a prosthetic leg are seen burning in an outdoor fireplace. The body is obviously Rosalyn, and Wesley is inconsolable. The group tries to explain to him that this proves aliens didn't take his mother, but Wesley argues back that aliens didn't keep his mother. This is what they do with the people they don't want. His Grandpa had shown him photos. Immediately, the mothership appears overhead. They're here. Inside, the trio tries to explain to Wesley, once more, that he is troubled. Audrey can't get through to him. As the aliens move ever closer, Duke contends they have to do something to put a stop to this, implying he wants to kill Wesley. Nathan has an epiphany, and realizes that Wesley's Grandpa must have had the same trouble. He manages to convince Wesley that his Grandpa left willingly with aliens to learn the truth about them, and to keep them from annihilating the population. Wesley glows with excitement that he could do the same thing, and ascends into the ship amid a beautiful beam of light. Question: how does that work? Apparently, I'm not the only one asking that question. Duke chastises Nathan for sending a troubled man inside his own head (okay, he put it differently, but this is more polite). How was this any different from just killing him outright. Nathan argues that maybe one day, when the troubles are over, Wesley will return with some great stories. Duke calls Nathan a hypocrite and leaves. Nathan finds Audrey, who is full of questions about the mystery man, how he knew so much about her, and if it is possible that the Colorado Kid could still be alive. Was she in love with the Colorado Kid? Vince and Dave offer to help, and Vince even tells her that he, himself, helped bury the Colorado Kid in plot 301 of the Potter's Field. Audrey demands to see the body. The next day, Thor and Nathan exhume the body while Audrey speaks to Frank, a forensic pathologist, on the phone. It seems Rosalyn's body had been in the fireplace for four hours when the group found her, but Audrey insists that can't be right. She had spoken to Rosalyn only an hour before. While she tells Frank to check his findings, the men open the coffin to find...bricks. Bricks, and the message, "Find him before the hunter." Audrey recognizes that the message is in her own handwriting, while a stranger with binoculars observes from a creepy mansion. This season, we can look for Haven to see its first serial killer, ghosts, more tattoos, and the possibility of Audrey vanishing again for good. This season opener has opened up a lot of brand new questions, and this viewer, for one, can't wait to learn the answers.